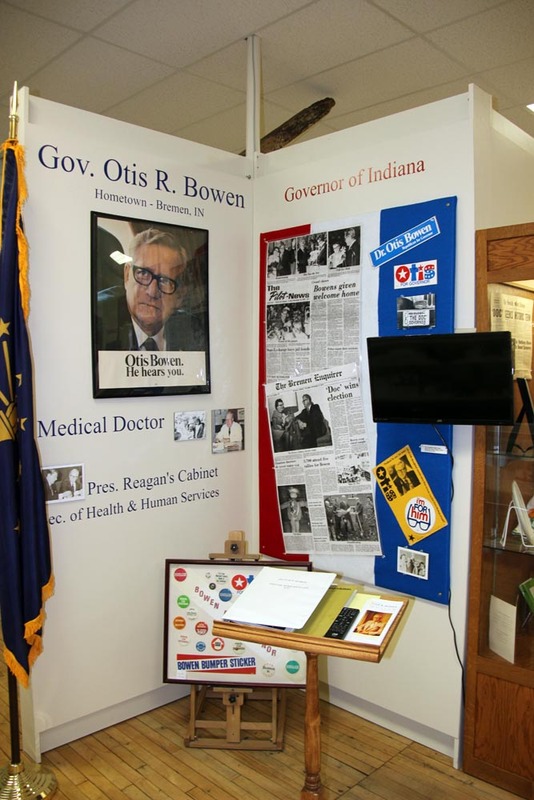 Doctor Otis R “Doc” Bowen was a Bremen physician who went on to become state representative, governor of Indiana, and Secretary of Health and Human services. The History Center display includes campaign buttons, news clippings, and a video presentation. “Doc” was born February 26, 1918 near Rochester, Indiana, to Vernie Bowen and Pearl Irene Wright. Vernie was a school teacher and also owned a hardware store in Leiters Ford. Doc graduated from Indiana University School of Medicine with an MD in 1942. He married Elizabeth Anne Steinmann in 1939. They had four children: Rick, Judy, Tim, and Rob. Following her death in 1981, he married Rose May Hochstetler in September 1981. In 1991, Rose died. In 1992, he married Carol Hahn, a marriage that lasted until his death. 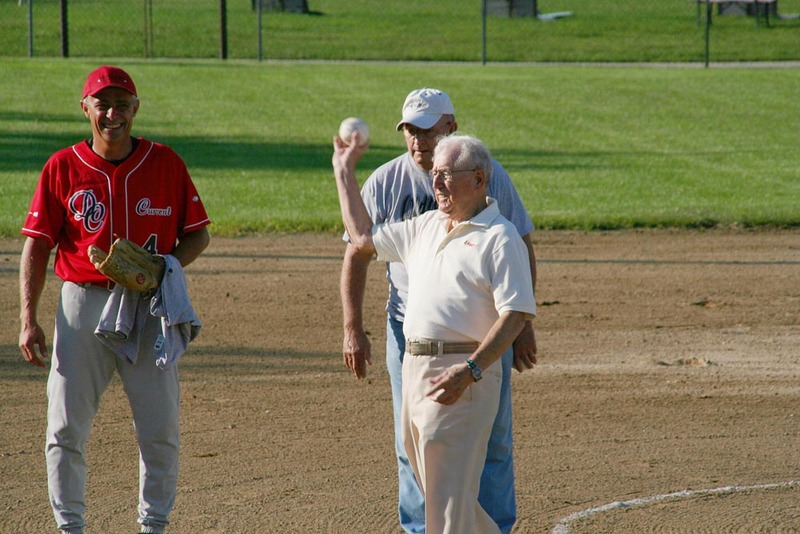 A softball pitcher in his youth, Doc throws a final pitch in 2007 at the Bremen Old-Timer’s softball game at 89. Behind him is Bill Carothers. Doc began his career on an internship from Memorial Hospital in South Bend, Indiana, in 1942. From 1943 to 1946 he served in the Medical Corps of the United States Army, rising to the rank of captain. Afterward, he set up his own medical practice in his home town of Bremen, Indiana. He also served as coroner for Marshall County, Indiana. Doc was long active in Republican Party politics, serving as a member of the Indiana House of Representatives from 1956 to 1958 and again from 1960 to 1972. He was speaker of the house from 1967 to 1972 and held other posts. After one unsuccessful attempt, he was elected Governor of Indiana in 1972 and was re-elected for a second term in 1976, making him the first Governor to serve for eight consecutive years in Indiana since 1851. Doc continued teaching at Indiana University until he was appointed by President Reagan as Secretary of Health and Human Services, making him the first medical doctor to serve in this position. It is said that as Secretary, Doc always had a prescription pad handy, recommending remedies to treat minor ailments for both colleagues and members of the press. He served this position until 1989, when he retired to his home in Bremen, Indiana. Doc died May 4, 2013, at a nursing home in Donaldson, Indiana at the age of 95.